Peter Mensah is a familiar face on television screens as he is popular for a lot of roles he has played on various movies and television series. You might at the snap of a finger, remember him as Oenomaus in the Starz action series, Spartacus, Terwase in Tears of the Sun and/or Jaffa in Hidalgo. Beyond these, do you know that the actor previously trained as a professional martial artist and also worked as an engineer? If that piqued your curiosity about Peter who rose against all shackles of racial discrimination to be where he is today, find out more interesting things about his personality, including his family and other hitherto unknown facts about the seasoned actor. On the 27th of August 1959, Peter Mensah was born in Chiraa, Ghana to parents who were from the Brong Ahafo Region in south Ghana. His parents were academically inclined and same would go for Mensah and his two younger sisters. When he was still tender, his family relocated to Hertfordshire, England where his father Peter Osei Mensah worked as an engineer and his mom, as a writer. While he grew up in the city of St. Albans in London, England, Peter loved martial arts and began practicing when he was about 6 years old. He also nurtured an interest for performing arts but went the path of training and qualifying as an engineer through the university just like his father. The Ghanian born actor soon began working with a British gas firm before deciding to move to Canada to try out a career in what he loved doing as a child – acting. In Canada, Peter Mensah built the foundation of his now successful and respected acting career. The Ghanaian-British actor had his first work in Nancy Drew (1995); he appeared as Simon in an episode of the television series. Two years later, he starred in Exhibit: A Secrets Of Forensic Science as Charles Ssenyonga and began getting roles more frequently thereafter. To date, the actor’s biggest roles include but is not limited to his portrayal of Terwase in Tears of the Sun (2003), his role in Hidalgo (2002) as Jaffa, 300 (2006) where he acted as the Persian Messenger, and the Starz original series Spartacus where he portrayed the character of Oenomaus. More recently, Peter Mensah made appearances on 6 episodes of Agents of S.H.I.E.L.D. (2018) as Qovas. For a seasoned actor like Peter Mensah, his works speak volumes of the class and quality he brings. For this reason, the actor has been well rewarded for all what we have seen him do over the years. Peter has a net worth reliably reported to be about $5 million with an annual income of about $606,000. Aside from what he earns from his acting jobs, the Ghanaian-British actor also earns handsomely from product and brand endorsements, sponsorship ads, and making appearances on shows and programs. The Spartacus star, to the surprise of many, is not yet married. To add to this, the actor has not been spotted with any lady that he could be said to be dating. This made some of his fans and non-fans alike to begin to speculate about the actor’s sexuality. Anyway, Peter once revealed that his reason for still being a bachelor is all because of his work. Apparently, he hasn’t had the time to plan about a family. He added that he would get married and start a family soon. When he does take someone to be his lovely wedded wife, we’ll be around to let you know all about it. 1. The actor stands at a height of 6 feet 3 inches (1.90 m) and he weighs about 215 lb (98 kg). 2. He is dark skinned, mostly known to be bald, has brown eyes and spots a muscular physique. 3. The Ghanian born actor is a member of the popular Ashanti tribe but was raised in England. 4. 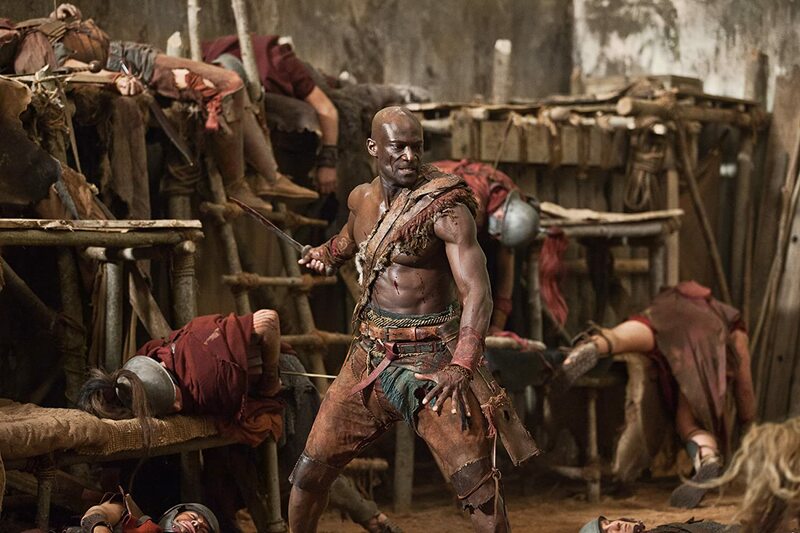 Reports have it that Peter Mensah went through a 3 weeks boot camp to adequately prepare for his role as Oenomaus on the Starz historical drama, Spartacus: Blood and Sand. 5. He has also been featured in a video game, Dead Space (2008) as Sgt. Zach Hammond. 6. Though acting has always been what he wanted to do with his life, Mensah is believed to have studied and begun working as an engineer to please his father.